November 9th: Save the Date! 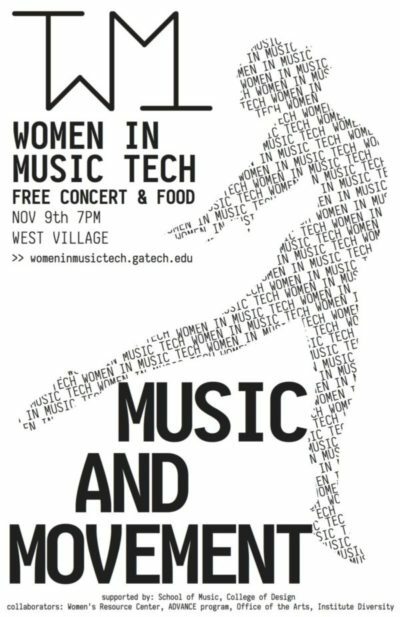 The Women in Music Tech group is proud to announce the second edition of their fall concert and reception! Immerse yourself in the universe of Movement and Music through music technology and discover how we control music with gestures and videos with sound features, while exploring the intimate relationship between dance and music with us. Listen to performances from the Women’s Choir, music technology students, and a piece from our special guest composer, Dr Dorothy Hindman. The concert is free and will take place in the new building on campus: The West Village concert hall on November 9th at 7pm, and will be followed by a reception with music, interesting conversations, food, and beverages. Say you’re going and invite friends on our Facebook event!